This morning we hiked to Khamsum Yuelley Namgyal Chorten. It was about a 45 minute uphill hike. The first part was through some rice paddies, which were surprisingly beautiful. Although the hike was a little bit difficult for me with my cold, it was totally worth the hike. Once we reached the top, I sat on the steps to the temple and rested a bit. There were lots of dogs around, and one of them decided he was my buddy. The dogs here are very docile, but I don’t pet them because they are pretty dirty and some have mange and who knows what else. But this guy looked fairly clean, so I gave him some scratches behind the ears, and he plopped right down and cuddled up to me. There were also some tiny puppies that were adorable. All the dogs were extremely skinny. After a bit of a rest, we were invited inside the temple. We climbed all the way to the roof and were rewarded with a wonderful 360 degree view of the area. When went back down, Stephen took lots of pictures of the puppies – they were so cute. Then we hike back down, which was a little rough due to slippery spots, but I remained more or less upright for the remainder of the hike. After a stop for lunch, we visited the Punakha Dzong. It is an impressive structure. The dzongs were originally used as fortresses when Bhutan was at war with Tibet and others. All the windows are very high up and there are small slots used for shooting arrows at the enemy. 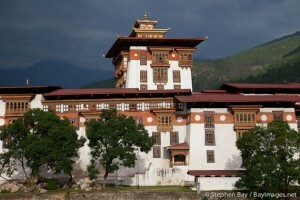 The dzong is 180 meters long and 72 meters wide. It has three courtyards. The first one is used for administrative purposes and houses a chorten and a bodhi tree. It is in this courtyard where the Punakha Tsechu takes place in February or March of each year. 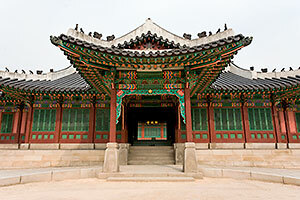 The other two courtyards are used by the monastic body. 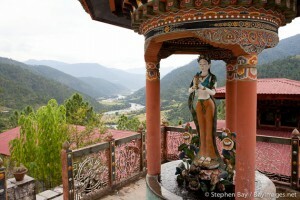 The third courtyard is the site of a temple that is considered the most beautiful in Bhutan. It certainly is the most beautiful one we’ve seen thus far. 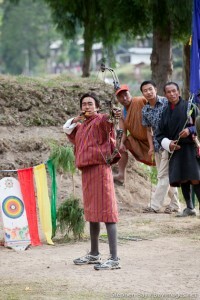 After the dzong, we walked over to an archery competition that was in progress. It turned out to be great fun to watch. Every time someone hit the target, his teammates performed a song and danced. I have some video of this that I will post when we get home. Stephen got some great pictures, then we headed back to the hotel. I haven’t been talking too much about our meals here, because there just isn’t that much variance. After dinner, we watched a bit of Gladiator on tv and conked out. I love to travel too, sis!